Truth be told, a lot of people don't have the ability to cultivate a proper work ethic. Whether they put their focus on distractions that don't lead to any positive returns or are too preoccupied with putting the proverbial horse before the cart, this idea of "grinding" becomes a full-fledged coping mechanism that individuals employ as they begin to rationalize why they aren't where they want to be. 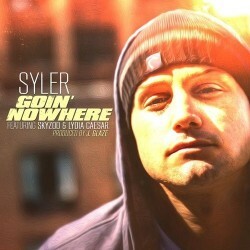 Many people are dreamers, but New York City based emcee Syler doesn't fall into this category. The guy has been perfecting his craft for ages and his latest track "Goin' Nowhere" stands as a testament to his pain staking dedication to the game. Bringing along Brooklyn veteran Skyzoo and vocalist Lydia Caesar (who absolutely kills it with an extremely catchy hook) , "the song is the textbook definition of what it means to be hungry and commit yourself to the process of hard work and excellence. With it's deep and moving piano sounds and poignant rhymes that go beyond the page, let "Goin Nowhere" be the soundtrack to your daily hustle. Though Slyer's next project, One Minute to Midnight, has yet to lock down a release date, we're eagerly anticipating to hear more from him.